Beautiful hand-wrought iron gates, grilles, architectural details, and fireplace equipment feature scroll work and floral embellishments, from many ancient towns in Italy. Medieval and rococo elements are plentiful. 487 full-page, black and white photographs illuminate details that will inspire blacksmiths and designers today. 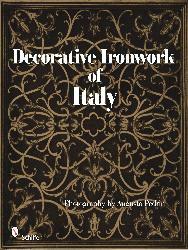 The original locations of the ironwork are identified in the text.